Opinion polls predicted a tight race for the presidential election in Kyrgyzstan held on 15th October 2017. However, Sooronbay Jeenbekov from the ruling Social Democratic Party gained over 54 percent of the vote, compared to around 34 percent for his closest rival, Omurbek Babanov, thereby eliminating the need for a second round. Outgoing President Almazbek Atambayev supported Jeenbekov, who has promised to continue Atambayev’s policies. Analysts have concluded that the use of so-called administrative resources in support of Jeenbekov played a significant role in influencing the election results. In a preliminary statement of findings, an international election observation mission led by the OSCE Office for Democratic Institutions and Human Rights (ODIHR) concluded that the election was “competitive” and provided for an “orderly transfer of power”, while raising concerns about “cases of misuse of public resources, pressure and vote buying”. Opposition candidates, journalists and civil society representatives also reported on such violations. The international mission further criticised restrictions on media freedoms, civil society monitoring of the election, and on the conduct of assemblies at key locations in the capital during the pre-election campaign. 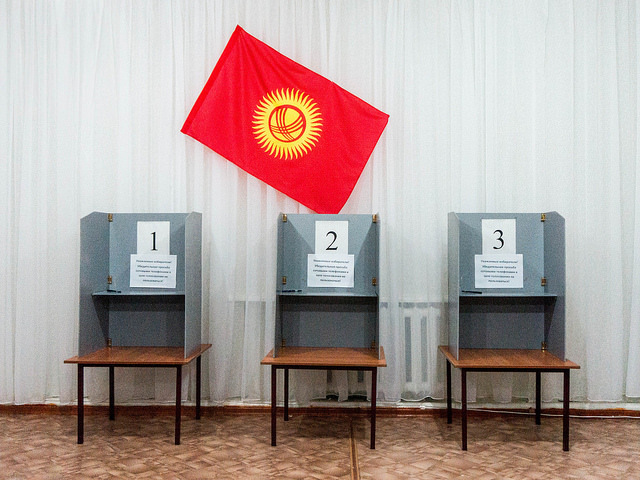 The media coverage of the election, especially by public media outlets, was biased, with widespread self-censorship, and several assaults on journalists being reported in southern Kyrgyzstan on Election Day. The banning of a media station for alleged “extremism” and the conviction of a journalist-writer on charges of inciting religious hatred also undermined freedom of expression during the pre-election period. These and other issues are covered in more detail in the sections below. International Partnership for Human Rights (IPHR) and the Legal Prosperity Foundation (LPF) have prepared the current update for the CIVICUS Monitor on developments concerning freedom of expression, association and assembly in Kyrgyzstan from mid-August to mid-October 2017. As covered in earlier updates, pressure on media reportedly increased in the months leading up to the presidential election. The international election observation mission monitoring the presidential election also voiced concerns about restrictions on media freedom during the election campaign. The mission concluded that defamation lawsuits and complaints about defamation filed by the incumbent president and candidates against media outlets (see more below) “had an adverse effect on public debate and resulted in self-censorship”. The mission also raised concerns about insufficient and biased media coverage of the election campaign, in particular by public TV broadcasters. The mission noted that incumbent President Atambayev de facto campaigned for Jeenbekov on such outlets, while making several harsh statements against his main rival, Babanov. The observation mission pointed out that several TV stations, including public broadcasters provided unbalanced and out-of-context coverage of a speech made by Babanov when addressing the local Uzbek community in Osh on 28th September. The coverage implied that his speech incited inter-ethnic hatred. Kyrgyzstan’s Ombudsman Kubat Otorbayev also criticised the Public TV and Radio Corporation (ORTK), which is funded by taxpayers’ money, for broadcasting information discrediting one of the candidates, namely Babanov. He stated that this violated the obligation of the broadcaster to ensure objective, reliable and balanced coverage. At a press conference held on 16th October 2017, after the preliminary election results had been announced, Babanov himself said that public TV channels were used to “pour dirt” on him and his supporters and that there was “a black PR [campaign]” against them. Another candidate in the presidential election, Temir Sariyev, who gained about three percent of the vote, said that the election campaign was characterised by “growing pressure on media conveying alternative views” and criticised public TV channels for serving the interests of one candidate, rather than informing about all candidates. There were several reports of attacks on journalists covering the presidential election in Osh on Election Day. A journalist from the NTS TV station, Mirbek Aitikeev reported being assaulted at a polling station, when he arrived to look into allegations of voting violations. According to him, unidentified, athletic-looking men confiscated his mobile phone and forcefully dragged him out of the polling station. He said that he was hit a few times on his kidneys and that police officers there did nothing to intervene. The head of the Central Election Commission later claimed that the information on the journalist being beaten had not been “confirmed”. Kloop journalist Begimay Bekbolotova announced that she had filed a complaint with police about an incident during which an unknown man threatened and offended her at a polling station, demanding that she leave the venue and forcefully taking her phone and deleting photos and video recordings. At the same polling station, unidentified perpetrators also reportedly confiscated the camera flash drive of two journalists working with AKI Press. They eventually managed to recover their equipment. Radio Free Europe/Radio Liberty correspondents Sanjar Eraliev and Ydyrys Isakov said that they were threatened by athletic-looking men who tried to take their equipment when they were filming at another polling station. In a press release issued on 17th October 2017, the OSCE Representative on Freedom of the Media raised concerns about the reported attacks on journalists on Election Day and called on the authorities to swiftly investigate these allegations and bring the perpetrators to justice. As reported before, in recent months the General Prosecutor has initiated a series of large-scale lawsuits against the independent Zanoza news site, its co-founders and journalists Narynbek Idinov and Dina Maslova, human rights defender Cholpon Djakupova, as well as lawyers from the opposition Ata Meken party because of articles on Zanoza deemed to be defamatory of President Atambayev. Courts have ruled in favour of all these lawsuits, ordering the defendants to pay a total of several hundred thousand EUR as compensation for alleged moral damages to the president. The court decisions, which have been upheld on appeal, have been widely criticised by human rights defenders and media watchdogs as undermining freedom of expression in the country. The Zanoza site was also forced to close as a result of a court decision and was relaunched as kaktus.media. In another recent case involving a disproportionately large request for compensation for alleged defamation, a Bishkek district court ruled in favour of a lawsuit brought by president elect Jeenbekov against the 24.kg news portal and journalist Kabay Karabekov. In its decision issued on 5th October 2017, the court ordered each of the defendants to pay five million som (62,000 EUR) in compensation to the candidate. The multi-million som lawsuit concerned an article that Karabekov authored and the news portal published in September, which reported on President Atambayev’s visit to Russia. The article suggested that a major purpose of the visit was to discuss prospects for the Kremlin’s cooperation with Atambayev-endorsed presidential candidate Jeenbekov and it referred to issues that may influence this cooperation, such as alleged ties between Jeenbekov’s family and Arabic organisations deemed “extremist” in Russia. Jeenbekov went ahead with the lawsuit, although 24.kg had removed the article from its site at his request. Several presidential candidates also filed complaints about alleged defamation with the Central Election Commission, requesting that media’s accreditation be revoked. Babanov announced that he had filed lawsuits against the ORTK and other pro-government media outlets that he claimed had published false information about him. On 12th September 2017, a Bishkek district court found journalist and writer Zulpukar Sapanov guilty of inciting religious hatred and sentenced him to four years in prison. The national security services had brought the charges against Sapanov because of a book he wrote in 2016 about pre-Islamic faiths and beliefs of the Kyrgyz people, which was criticised by influential representatives of Islam in the country. In its ruling, the court found that the book “diminishes the role of Islam as a religion” and “creates a negative attitude toward Muslims”. The sentence against the journalist caused an outcry. Ombudsman Otorbayev called it “a return to the time of inquisition”, saying that “imprisoning a person for expressing certain, even if wrong views is unacceptable for a secular state in the 21st century”. The international media watchdog, Reporters without Borders stated that Sapanov’s imprisonment set “a disturbing precedent for freedom of expression” in Kyrgyzstan and called for his release “without delay”. On 29th September, when hearing the case on appeal, Bishkek’s City Court replaced Sapanov’s prison sentence with a suspended two-year one and released him from the courtroom. This is not the first time “incitement” charges have been used against a journalist. As covered earlier on the CIVICUS Monitor, national security services opened a criminal case on inciting inter-ethnic hatred against independent journalist Ulugbek Babakulov in June 2017 after he drew attention to aggressive nationalism on social media. Fearing politically-motivated imprisonment, he fled the country. His family who remains in Kyrgyzstan has been subjected to ongoing surveillance by people believed to be from the security services. As previously reported, a Bishkek district court issued a ruling in late August 2017, banning the activities of the September TV station for disseminating “extremist” material. The charges against the TV station concerned an interview with a former regional police chief, who accused Sooronbai Jeenbekov and his brother of misappropriating government funds that had been allocated in connection with the June 2010 events in southern Kyrgyzstan. The court ruling was widely criticised by the journalist community and the Ombudsman, among others. The Media Policy Institute called the ruling “unlawful”, arguing that it violated national law. Ombudsman Otorbayev concluded that it was “harsh” and that the allegations of extremism leveled against the TV station were “exaggerated”. In mid-August to mid-October 2017, dozens of assemblies took place in Kyrgyzstan as part of the pre-election campaign ahead of the presidential election. Public events organised by candidates running for president gathered several dozen to several thousand participants. They were all peaceful in nature. As reported before on the Monitor, in July 2017 a Bishkek court ruled in favour of a request from the mayor’s office to prohibit assemblies, with the exception of official events, outside the parliament and presidential office and at other venues in the capital’s central Pervomaisky district until 20th October. On 26th September, another local court approved a similar request from the mayor’s office and banned assemblies in the capital’s Oktyabrsky district during the pre-election and election period. This measure followed an initiative by civil society activists to organise a peaceful march on 30th September to call on the presidential candidates to ensure a fair election. As already highlighted on the Monitor, these types of blanket bans on holding assemblies in certain locations for several weeks are highly problematic in light of national and international standards on freedom of peaceful assembly. In its preliminary conclusions, the international mission that monitored the presidential election also stressed that the court-imposed bans on public gatherings near official buildings during the election period were contrary to national and international law. While the court bans and the risk of sanctions for violations discouraged peaceful protests in the districts in question, there were also cases were citizens defied the court-imposed restrictions. On 19th September 2017, Yevgeniy Pogodayev held a protest outside the parliament in support of his son, who he believes has been unfairly imprisoned on charges of serious crimes. In another case, in early September a group of residents of the city of Kara-Balta, who lost their real estate property due to an alleged scam, held a picket outside the parliament and presidential office. Police officers in turn obstructed attempts by the participants to display the posters they had brought with them. As noted by the international mission monitoring the presidential election, Jeenbekov’s final campaign rally took place at the Ala-Too Square in Bishkek on 13th October, despite the court ban on gatherings there through 20th October. A concert, featuring popular singers, was held at the square in his support. In its preliminary findings on the presidential election, the international monitoring mission led by the OSCE’s ODIHR noted that “civil society organisations played an important role in civic and voter education campaigns and undertook comprehensive long-term observation, which contributed to increasing the transparency of the electoral process”. At the same time, it regretted that recent legal amendments limited the number of observers that civil society organisations can deploy, as well as restricted their mobility on Election Day and removed the right of citizen observers to appeal election results. As covered before on the Monitor, parliament adopted the new legal restrictions on civil society monitoring in May this year and the president signed them into law in June. MPs sought to justify these provisions by claiming that civil society monitors “lack objectivity” and may “disturb” the conduct of elections by favouring certain candidates. As reported before on the Monitor, in August 2017 a local court in the Jalal-Abad region of southern Kyrgyzstan initiated a hearing on a complaint filed by imprisoned human rights defender Azimjan Askarov regarding a decision to sanction the confiscation of his family’s house as part of the execution of a 2010 court ruling on his case. Askarov objected to this decision on the grounds that his wife resides in the house and national law prohibits confiscating property in which family members of convicted individuals live. On 5th September, the court ruled in favour of Askarov’s complaint and repealed the decision to sanction the confiscation of his house. His family and human rights defenders welcomed this decision. The trial was observed by international monitors representing Amnesty International, Kazakhstan International Bureau for Human Rights and Rule of Law and International Partnership for Human Rights. Askarov is serving a life sentence for his alleged role in the June 2010 inter-ethnic violence in southern Kyrgyzstan. Earlier this year, an appeals court upheld his sentence during a re-trial, which failed to properly address violations raised by the UN Human Rights Committee in its 2016 decision on the case. The UN body then called for the immediate release of Askarov and quashing of his original conviction. 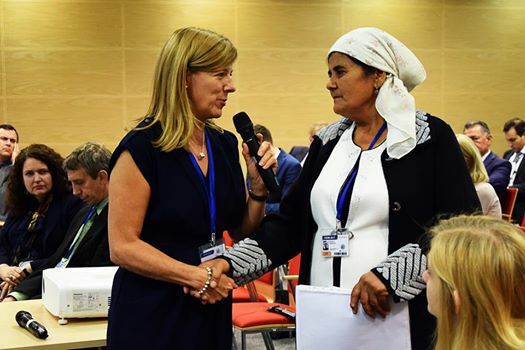 Speaking at the annual OSCE Human Dimension Implementation Meeting in Warsaw in September 2017, Askarov’s wife, Khadicha Askarova, stated that the court decision in the property confiscation trial was ”the first step toward justice and rule of law” taken by the authorities in her husband’s case. She thanked all who have supported him and his family in the past years and pleaded for renewed efforts to ensure the release of her husband, whose health has deteriorated in prison, as well as for justice for others imprisoned on charges relating to the June 2010 events following unfair trials.